The avionics you use is just as important as the plane you fly. With constant revisions to charts, it is important to make certain your data is up-to-date with the latest information to make your flight free of worries. With Jeppesen, you can be assured that you will have the latest information in a timely, accurate manner. Note: If you are an existing customer with Jeppesen Distribution Manager (JDM) installed - look for the Jeppesen Services icon on your desktop in order to login and begin downloading your data. Not finding the Avionics package you are looking for? Did you know Jeppesen offers updates for Avionics packages for General Aviation aircraft? View them now. Learn more about Jeppesen NavData and Terminal Chart solutions for your Garmin system. Jeppesen & Honeywell offer Integrated Navigation Data Services for your Epic Inav system. 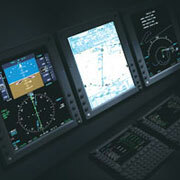 We are pleased to offer terminal chart services for the IS&S Cockpit Display. Maximize your Proline 21 display functionality with Jeppesen Terminal Charts. We offer Terminal Chart Services for your Universal Cockpit Display. Dassault Falcon Perf service for your flight operation.